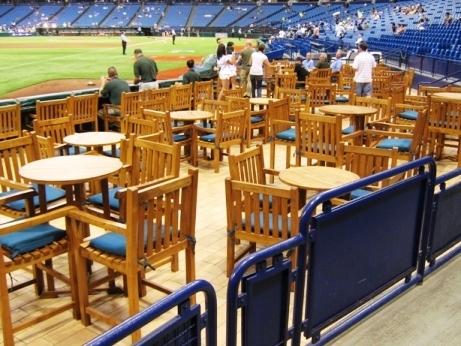 Tropicana Field doesn’t often get near the top of most fans’ lists of favorite ballparks. Indoor baseball, which was a novelty for a few minutes after the Astrodome opened, isn’t nearly as popular for a summer pastime as it once was. But I think some props for Tropicana Field are due. Then there’s that artificial turf that once threatened to take over everywhere when baseball seemed to care far less about tradition (unlike today, he says sarcastically). But as someone who has enjoyed a few games at Tropicana Field, in the ballpark’s defense I will say that it’s not all bad. In fact, it can be a perfectly nice place to see a ballgame for a few reasons. The Trop makes you feel welcome. 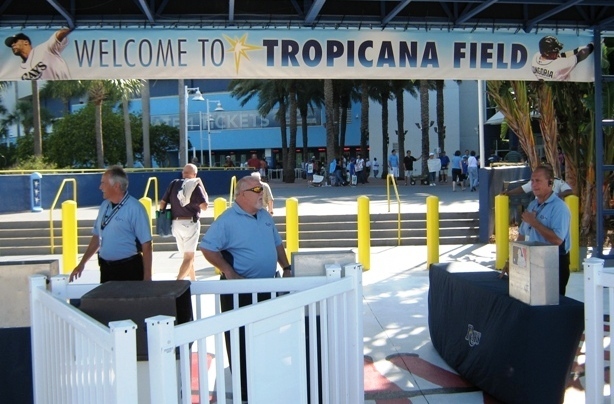 The Trop has greatly improved in recent years. The Rays have done a lot to fix up the place and make it more appealing for fans, and they deserve a shoutout for that. It has bright blue seats, which blend well with the green turf on the field. There is the the Porch in Center Field, a party area that replaced the Everglades BBQ, with drink rails and a full bar to watch the game party-style. The upper deck in the left field corner is a separate section called the tbt* Party Deck, and for lousy and mostly empty seats it’s got a neat bleachers feel to it. The concourses, in this observer’s opinion, are the best in baseball. There’s more entertainment for the kids than I’ve seen in most ballparks, like interactive games, comic book style representations of baseball history, picnic areas, and of course, the Rays Tank…because what’s more baseball than feeding some fish and sliming up your hand in a tank in the outfield? I know that sounds sarcastic, but it really is fun. Then there’s the huge statue of a Rays player sticking out of the wall to make a catch, appropriate for a defensive minded team and something that has to be seen to be believed. This is now the 162 Landing, for those who remember Game 162 in 2011. If you’re into partying with your baseball, Tropicana is great for that, too. There are plenty of great party areas, like the multi-leveled deck in center field and the 162 Landing and Papa John’s bullpen areas that are decorated accordingly. 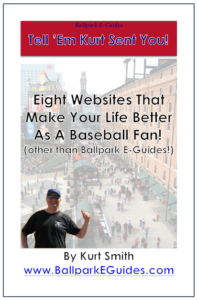 If you don’t mind the possibility of getting clocked by a foul ball (pay attention! ), the view is great and the party is very affordable. Then there are the cowbells that clang whenever an opposing player has two strikes on him. I don’t care if they are professionals, I know it gets under the skin of some players, which is exactly the point. The cowbells are a uniquely Tampa Bay thing (at least in baseball), and it wouldn’t work as well in an outdoor venue. When there’s a full house (which, granted, is rare), the cowbells can really rock the place. Who knew all they had to do was drop the “Devil” from their name? 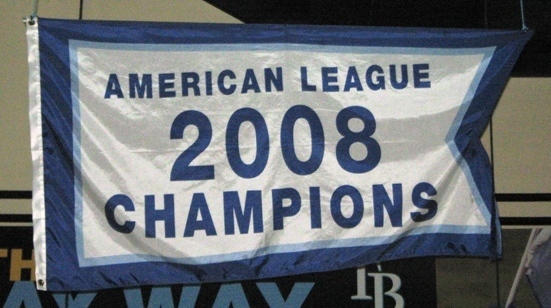 The Rays have even manage to put a good team on the field fairly often, which can override the flaws of any venue. Despite one of the lower payrolls in the game, the Rays have been playing pretty well, contending for an AL East title quite a bit in recent seasons. Not an easy thing to do when sharing a division with the big-spending Yankees and Red Sox. Best of all, the Trop is an affordable fun for the family deal. Between cheap tickets (no need to spring for great seats for a Rays game), free parking for cars with four or more, and being able to bring in your own food, the kids can have a memorable experience for a fraction of the cost of a day at Disney World, or any major attraction in Orlando, for that matter. 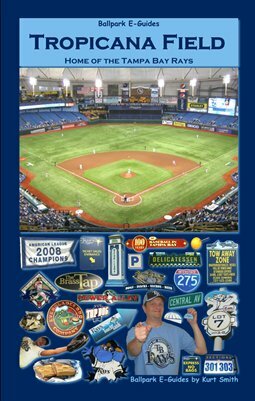 So while Tropicana Field may not score points for great views or neighborhood atmosphere or “retro feel”, in truth there’s no reason a baseball fan can’t enjoy a great day of baseball. One could argue that it’s even unique in its own way these days, with all of the retro-style ballparks across the country. The Trop is something different. Enjoy it. At least you’re not sweating or ducking out of a thunderstorm. And get the most out of the experience when you read this handy little guide.